FBI ACTS!!!... 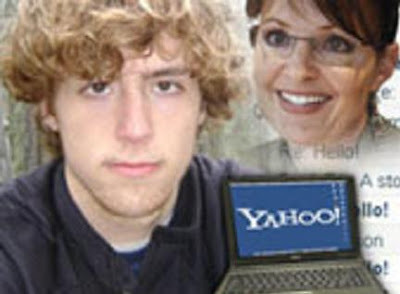 SERVES (suspected) PALIN HACKER DAVID KERNELL WITH SEARCH WARRANT!! FBI ACTS!! !… SERVES (suspected) PALIN HACKER DAVID KERNELL WITH SEARCH WARRANT!! Bummer… Feds break up a party to serve University of Tennessee student David Kernell with a search warrant! A court date was set for this week. David is a self-described Obamacrat and his father Mike Kernell is a liberal Tennessee State Representative. All signs pointed to the young Obama supporter as the Palin hacker. The federal agents put a damper on that university party! They had the students wait outsid while they took photos and evidence from inside the apartment for over an hour and a half. A Department of Justice spokesperson confirmed there has been “investigatory activity” in Knoxville regarding the Palin case, but she said there are no publicly available search warrants, and no charges have been filed. A separate law enforcement source confirmed to 10 News that a search warrant was served on Kernell’s apartment. According to the witness, several agents arrived at The Commons of Knoxville around midnight. They presented their badges upon entering Kernell’s apartment, where several students were having a party, and took down their names. He says Kernell’s three roommates were also subpoenaed, and must testify this week (Tuesday) in Chattanooga. Jammie Wearing Fool and The Tennessean have more. David Kernell and his father State Rep. Mike Kernell (D) met with a lawyer on Friday night. A proxy server led the FBI to Kernell… but bloggers knew who the (suspected) hacker was on Thursday. *** Would someone please forward this to the Los Angeles Times? FATHER OF HACKER Is Tennessee Dem State Rep!!!!! …Update: Name- David Kernell …Update: He’s Been Contacted by Feds! But Portfolio.com has learned that the IP address used by the Palin hacker originated from an Illinois-based ISP called Pavlov Media, which provides internet service to The Commons at Knoxville, a University of Tennessee student housing complex. In an interview with Portfolio.com, Gabriel Ramuglia, who runs Ctunnel.com, a proxy service used by the hacker to try to disguise his identity, said federal investigators asked him about a single IP address — a number assigned to a computer on the internet — which has become the focus of the government’s probe into the hacking of Palin’s Yahoo email account. “The person visited Yahoo Mail, 4chan.org, and the Web addresses that were visible in the posted screenshots,” Ramuglia told Portfolio.com Sunday night. Ramuglia declined to provide the user’s full IP address, but Portfolio.com has learned that the address falls within the range operated by Pavlov Media, formerly known as Fusion Broadband, which was created through a 2004 merger between Noment Networks and Distributed Management Information Systems, Inc. (DMISI). UPDATE 2: (Monday) The Washington Post carried a small story on the major political scandal today. UPDATE 2: The AP gets around to reporting on the David Kernell today.